Na Nach Nachma Nachman Meuman: My third 17 fast! Consider that the 17th day after Josef is born and died is this day of "brotherhood" when the walls of Jerusalem sunk because of lack of wealth wow. I hosted two Na Nach Mafitsim for shabbas and a shabbas with a Chocham is like a fast. Today is my third fast! (I also fasted last Sunday when I went from the Deuteronomy to Joshua following the schedule of President Rivlin). I was ordered to fast in letter 51 (I think) from the third book of Ebay Ha Nachal (Nissim Khayat edition). This little village is critical for world peace. Please join me for Shabbat anyone who does Hafatsa! 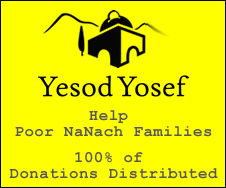 Help me to make it happen....our success will be complete when Rabbi Nachman's bones are brought to Jerusalem.